Exploring the challenge of keeping ourselves fed at a time of rapid social and environmental change. As global demand for animal protein surges, so do the environmental costs of producing it. Researchers in the Netherlands are exploring alternatives, from lab-grown burgers to edible insects to faux meat made from plants. But will people eat them? 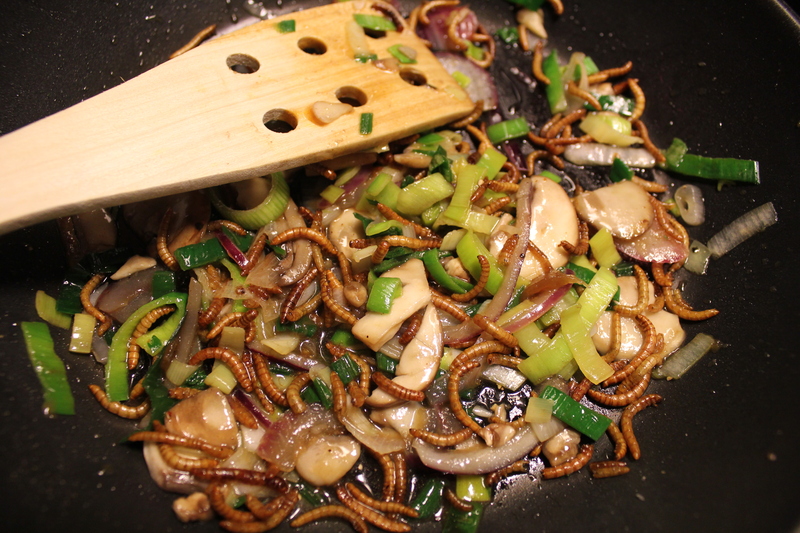 Stir-fried vegetables with mealworms. Photo by Jonathan Miller. In Seattle and other U.S. cities, a movement is growing to bring foraging from the margins to the mainstream as a hedge against climate change and food insecurity. 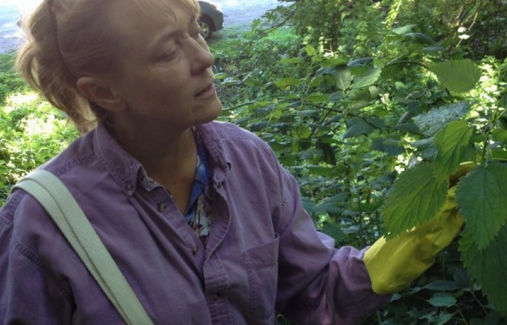 Melany Vorass Herrera, a forager in Seattle, with wild nettles. Photo by Joshua McNichols. Joshua McNichols is a producer for KUOW Presents and the author of The Urban Farm Handbook. Farmers in India say a novel way of growing rice and other crops has quadrupled yields while using less seed, water, and fertilizer. But some scientists doubt the gains are real. 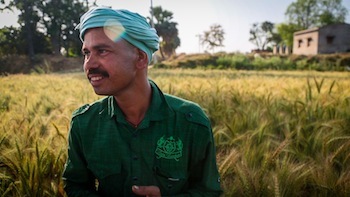 Farmer Sumant Kumar reported world record rice yields on his land in Bihar using a set of techniques known as the System of Rice Intensification. Many mainstream scientists are skeptical. Photo by Sam Eaton. In India, some farmers are replacing chemical fertilizers with the contents of their latrines. It’s cheaper and produces less greenhouse gas. Is it safe? 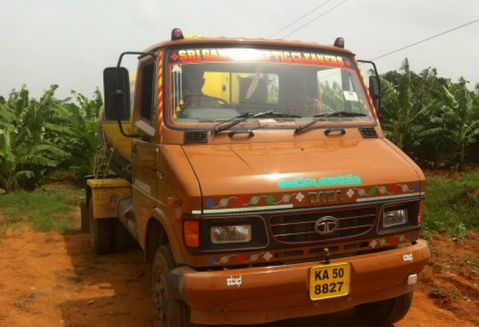 A truck in Bangalore, India, collects human waste from local latrines and spreads it on farmers’ fields. Photo by Bianca Vasquez Toness. Growing more food with less water will be one of the biggest challenges in the coming era of surging populations and increasing climate disruption. In China, scientists say they’ve developed a new irrigation method that’s twice as efficient as today’s best technology. 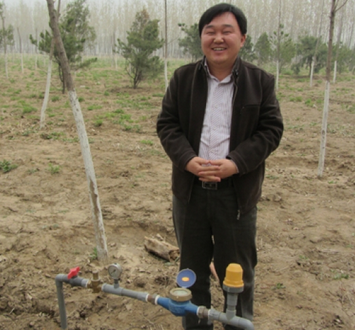 Irrigation agronomist Kim Ji-Seok visits an experimental farm outside Beijing. Photo by Mary Kay Magistad. Since announcing that it would become the world’s first carbon-neutral country, Costa Rica has been a laboratory for reducing the climate impact of agriculture. An industrial banana processing center in Costa Rica. Photo by Sam Eaton. Since announcing that it would become the world’s first carbon-neutral country, Costa Rica has been a laboratory for reducing the climate impact of agriculture. Both small and large farms have been looking for ways to decrease emissions. Aquaponics is a recirculating system for raising fish and vegetables that uses less land, water, and chemicals than traditional methods. For years it has attracted hobbyists but few others. A Ugandan entrepreneur thinks its time has finally come. 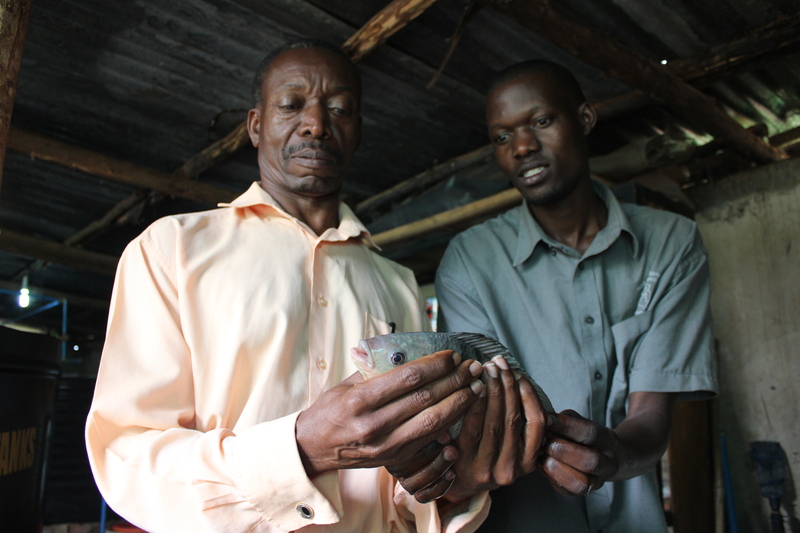 Engineer and entrepreneur Charles Mulamata (left) inspects a Nile tilapia from one of his tanks. Photo by Jonathan Miller. Meat consumption in China is soaring, and so are the greenhouse gas emissions that meat production causes. But there is a nascent counter-trend – a small but growing vegan movement in the country’s big cities. Vegan activist and singer Long Kuan and a friend enjoy meatless “lamb” kabobs at a Beijing restaurant. Photo by Mary Kay Magistad. In the desert of Qatar, scientists and engineers are working to transform “what we have enough of” – sand, sunlight, sea water, and CO2 – into “what we need more of” – energy, fresh water, and food. Does their idea hold promise for the world’s driest places? The Sahara Forest Project is intended to mimic a natural ecosystem, with the waste product of one component serving as the fuel or fertilizer for another. The project’s designers say the concept should work in any low-altitude desert area near a large source of salt water. Above, an artist’s rendering shows a full-scale commercial facility. Graphic provided by Sahara Forest Project. Scientists in the U.S. and Uganda have developed genetically engineered cassava plants that resist two devastating viral diseases. Is it a boon for small farmers or a Trojan horse? 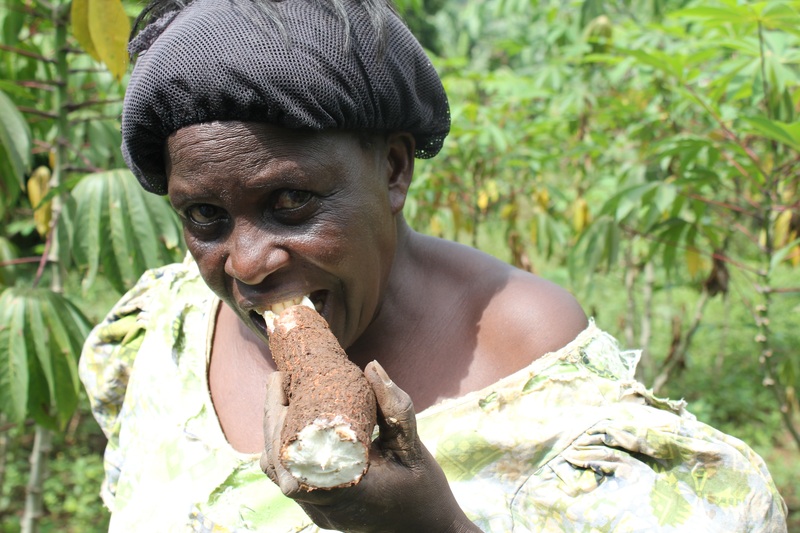 Ugandan farmer Eva Mugalu samples cassava from her property north of Kampala. Cassava is an important food security crop for millions of Africans, but it is susceptible to viruses. Scientists say they are nearly ready with a genetically engineered virus-resistant variety. Photo by Jonathan Miller. For years, proponents of genetic engineering have said that gene-splicing technology can help the world’s poorest farmers – making their crops more nutritious, or more productive, or protecting them against drought and pests and diseases. But they haven’t had much to show for those claims. Even in developing countries, most of the land area planted in GMOs is devoted to commercial crops on industrial farms. Opponents of GMOs have included that fact among their many arguments against transgenics. Today, though, there are dozens of genetically engineered crops in the pipeline that are specifically aimed at small-scale farmers in poor countries. In many cases, they are being developed by public sector scientists who plan to make them available at little or no cost. In this story, we travel to Uganda to meet researchers working on a genetically engineered cassava variety that resists two devastating viral diseases. The scientists say it’s the best hope for saving a critically important food security crop. But critics question whether the new variety is really necessary and suggest that the real goal is to break down resistance to GMOs on a continent that has been wary of the technology. Are GMOs a boon for Africa, or are they a Trojan Horse? Agriculture is the third-largest emitter of global greenhouse gas pollution. Yet roughly one-third of what we produce is never eaten. 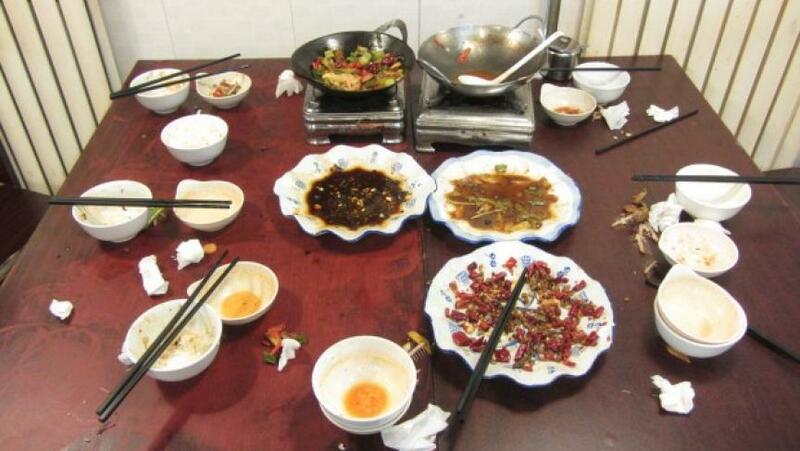 Cutting down on waste is a major challenge in China, where a grassroots “Clean Your Plate” campaign is taking aim at deeply ingrained attitudes toward leftovers. Marketing executives Zhang Ye and Xia Xue helped organize China’s “Clean Your Plate” campaign when they saw students at a Beijing university throwing away huge amounts of food. But they say the problem extends all the way up to government officials, who are notorious for holding lavish banquets. Photo by Mary Kay Magistad. Some of the biggest players in the sustainable food movement are food service companies with the buying power to change the way millions of people eat every day. 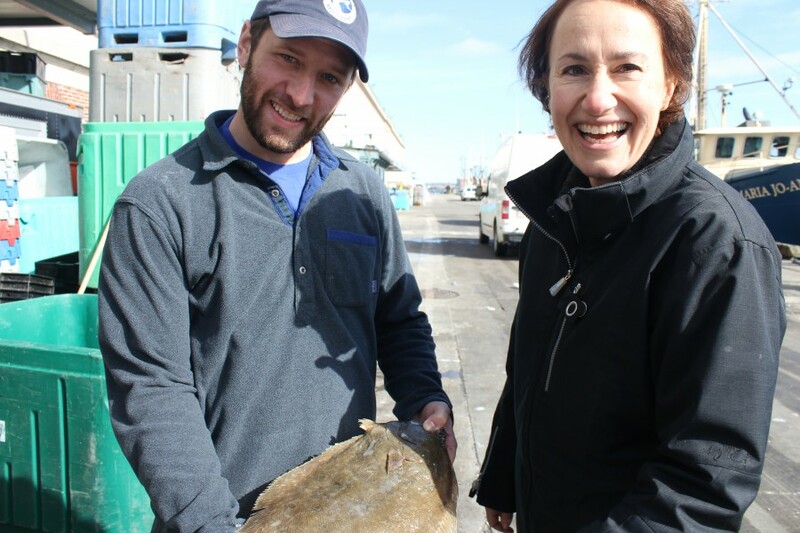 Helene York of Bon Appétit Management Company meets Jared Auerbach of Red’s Best Seafood at the Boston Fish Pier. Auerbach buys from small- and medium-scale fishermen around New England. York says smaller suppliers play a key role in a sustainable food system. Photo by Jonathan Miller. A new super-efficient vertical farming system is producing greens for Singapore’s 5 million residents. Inventor Jack Ng hopes to increase local food security while helping cut down on the climate impact of food production. 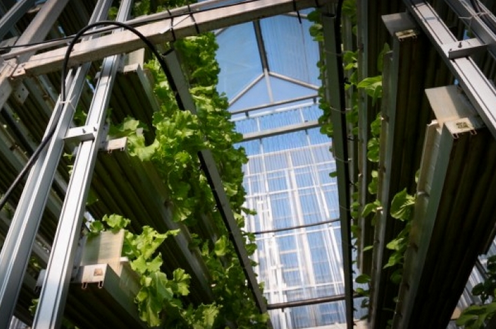 With a footprint of about 65 square feet, each SkyGreens tower is ten times as efficient per unit of land than conventional farming methods. Photo by Sam Eaton. A video version of this story aired on PBS NewsHour.